“For decades, scientists have known how birds with yellow or red feathers usually get their color: It comes from pigments in foods the birds eat. Flamingoes, for instance, extract pink pigments from algae and crustaceans they filter out of the water. The challenge has been to figure out exactly how blue birds get their color. It can’t be their diet: blue pigments, like those in blueberries, are destroyed when birds digest them. . .
“Richard Prum, an ornithologist at Yale, discovered that birds make blue feathers in a different way. 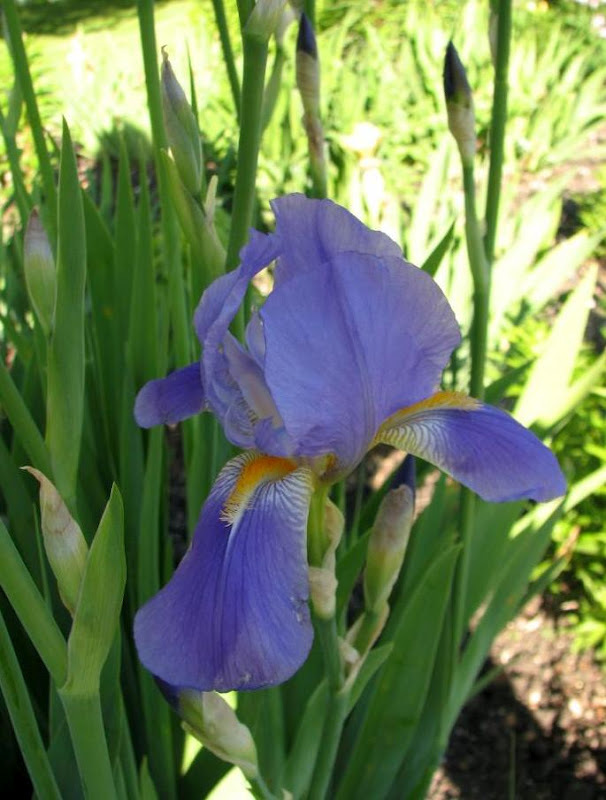 . .
Blue, in irises, is produced by the presence of anthocyanin, a pigment, not air pockets. But the article shows that the interplay of light and structure affects the eye’s perception of color. 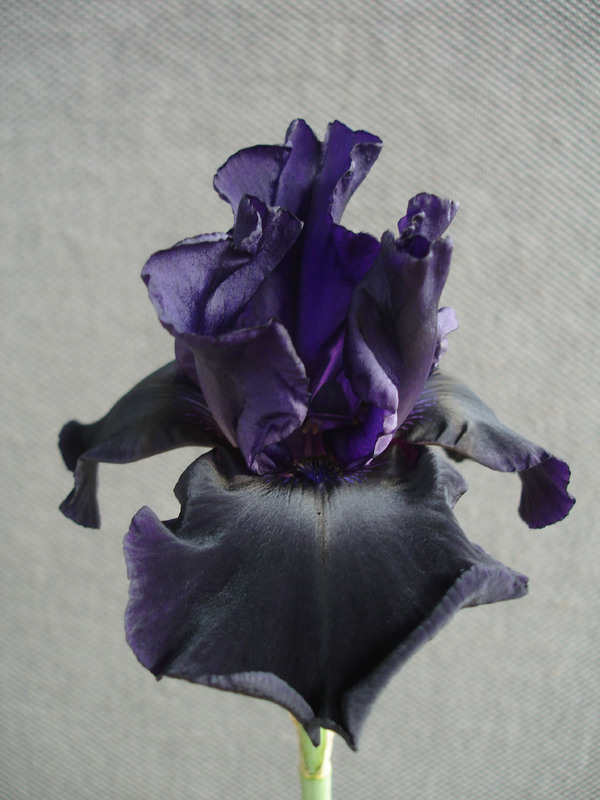 It’s been my thinking that the way we perceive certain aspects of the coloration of irises, such as shading and intensity, is also affected by that interplay. In the case of the seedlings that I have observed over the years, it happens that, in most cases, the color is red. The first seedling that caught my interest in this regard was 985R4, a bee cross on 953P (Holy Night X 93RR2 (Margarita x Momauguin)). This is a scarlet flower with a pronounced sheen. I believe that the sheen is caused by how the structure of the flower’s petals reflects light to our eyes. Whatever is causing that effect, it was transmitted to 985R4's progeny, 062X27 (985R4 X Cherry Glen), but to a lesser degree. And, in 062X27, we also see what we call “diamond dust” pr sparkles on the petals. ‘Prince Igor’, whose too-lengthy-for-here pedigree is unrelated to 985R4 (as far as we know – but what may 985R4's bee know? ), also has a sheen. and, to a lesser extent, in its sibling 072O22, which also displays “diamond dust”. Another 'Stealth Fighter' derivative, 09S12 (Stealth Fighter X Holy Cow), shows pronounced sheen, top and bottom, in a very ruffled flower. If the structure of the petals can “sharpen” colors, it can also “soften” them, I believe. Here, for example, is ‘That Certain Something’, which appears to have a suede-like texture. 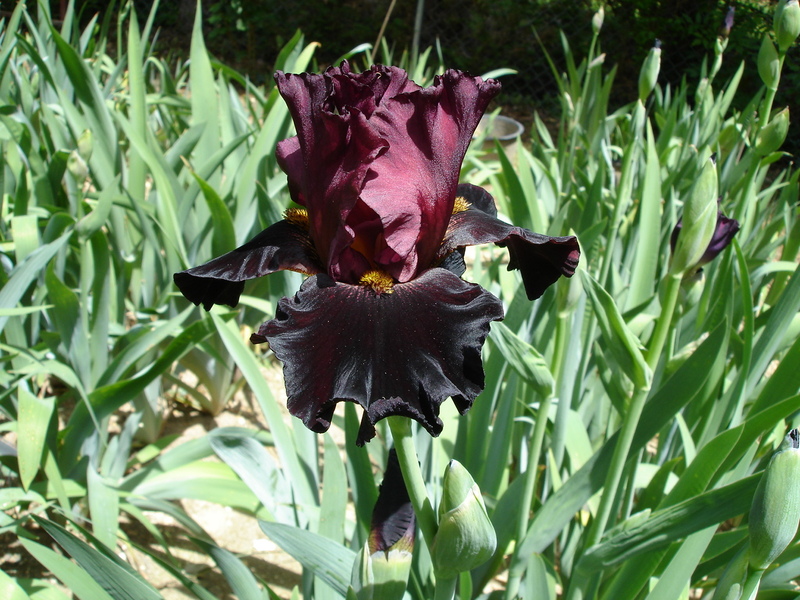 As with 985R4 and 'Stealth Fighter', above, ‘That Certain Something’ also imparts its softer tone to its progeny, as in the case of seedling 042F3. 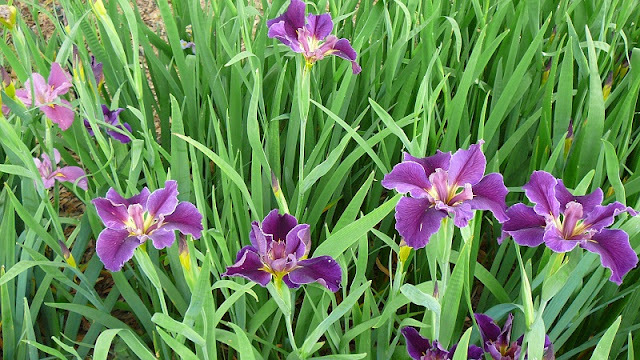 So something may be going on in the way that we perceive color in irises. I suspect something similar is at work with irises which appear to change color during the day. If I’m correct, a reader with a greater degree of scientific knowledge may say, “Well, anybody who didn’t flunk physics should know that!” But I’m willing to suffer the slings and arrows in order to broach the discussion, because, when we know how something works, we can begin to manipulate it. Does anyone else see it this way? 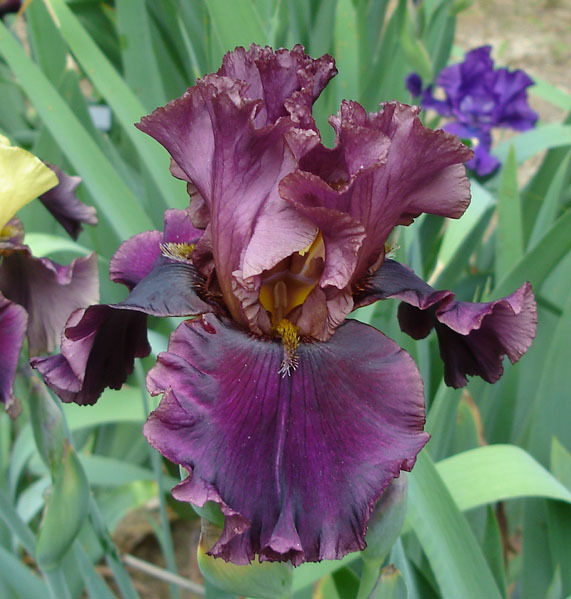 When I received my first Schreiner's Catalog in the mail about fifteen years ago, I was bewildered by all of the terminology in the iris descriptions. What could the word "self" possibly mean in relation to an iris? And amoena looks like a type of tidepool creature. Plicata, although fun to say, sounds like either a musical term or a type of pasta. As I pored over the catalog, I slowly began to learn the differences. 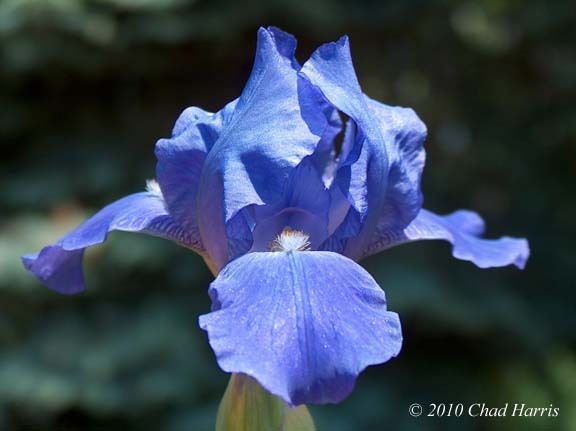 For those of you who are new to irises, I hope this series of short posts on iris color classes will speed up the learning process. 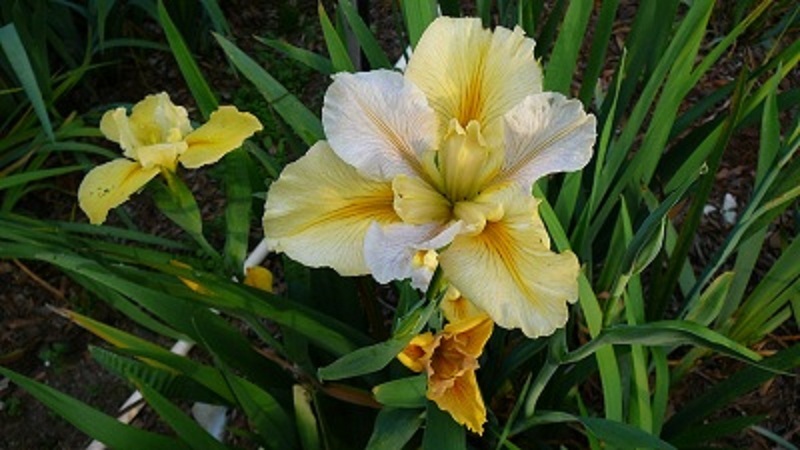 An AMOENA is an iris with white standards and colored falls. 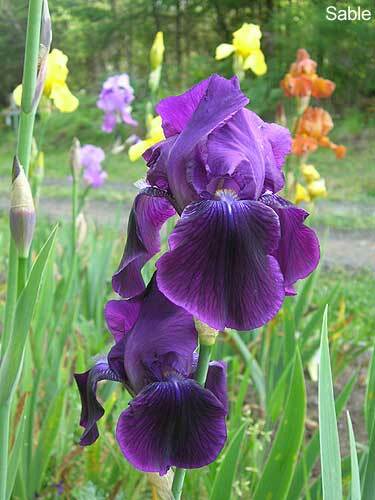 It's my very favorite color pattern, and was the first color type of iris I ever bought from a catalog. The iris below is called 'Fashion Passion', a tall and vigorous bloomer in here in Southern California. 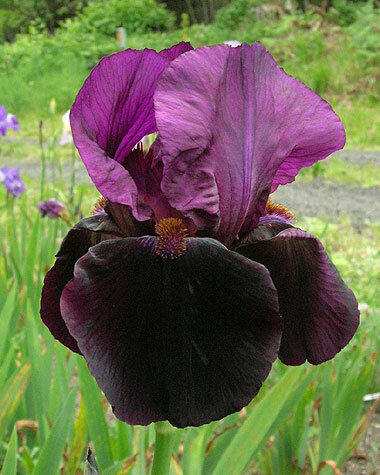 Perhaps the most famous amoena is 'Wabash', an historic iris that is still among the most popular irises in commerce. The falls on this iris seem to have a neon glow. I'm still searching for a photo of this iris I saw years ago that made my eyes wide with desire. When I find it, I'll share it with you. For now, look at this gorgeous clump from the Delaware Valley Iris Society. A favorite of mine is 'Ringo', even though it does not like me much. I love the white rim around the falls. Above all other flowers, I am smitten with red amoenas. I am still looking for one with solid red falls that will grow well for me. Although 'Looky Loo' has sanded instead of solid falls, it comes very close to my idea of flower color perfection. Something about that frothy white whipped cream on top makes me amoena crazy. Do you have a favorite amoena? What color would you like to see in the falls with that lovely white? Iris lovers are always asking me to name my favorite iris. That is hard to do when you have so many. I have never been able to pin it down to just one favorite so I though I would share with you some of the irises that are in the running. 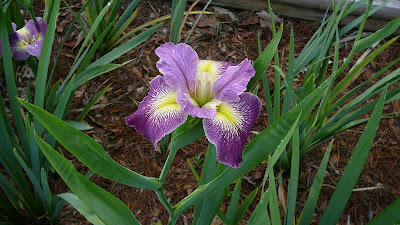 I'll start with an iris by Richard Sloan, a close friend in Bossier City, LA, who has produced many beautiful irises. 'Amber River' has nice colors, is a good garden iris, and I really like the form and the style arms. 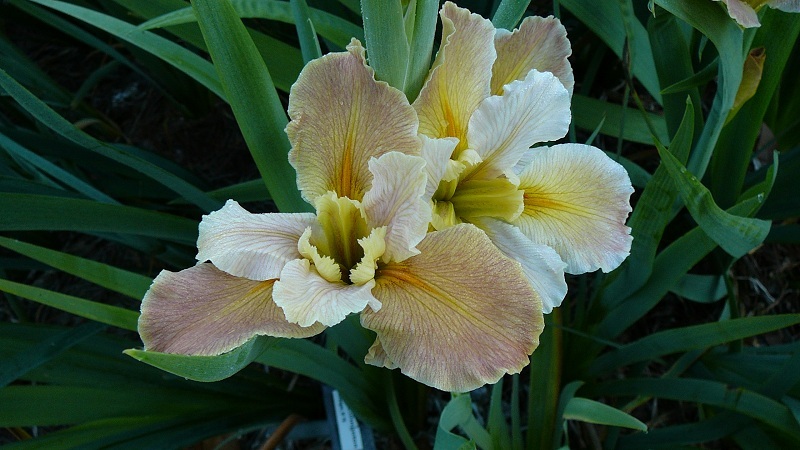 Farron Campbell is a former president of the Society for Louisiana Irises and hybridized many exceptional irises. I like 'Atchafalaya' (Ugh chaf ugh lie ugh) because of the "Louisiana" name and the "cartwheel" form, as well as the vivid color. It also has a "halo" around the edge of the petals. We have a large bed of this iris and when it is in bloom it really puts on a show. 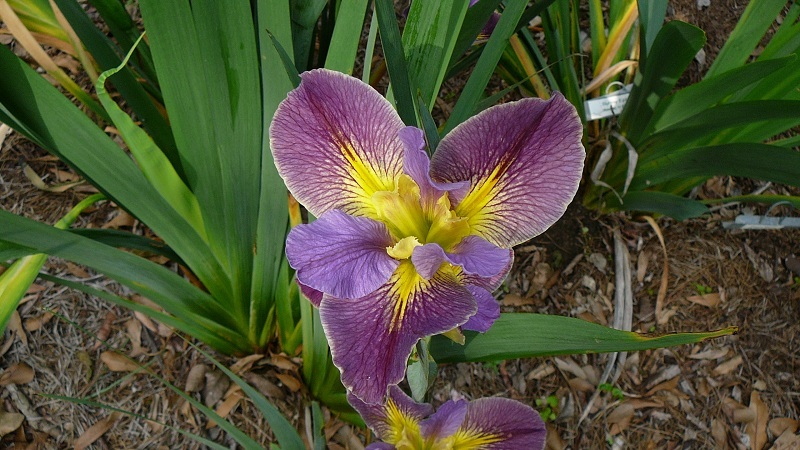 Marvin Granger discovered a cartwheel form iris in the wild in the marshes of south LA and collected it. He crossed the iris and produced several more "cartwheel form" irises. 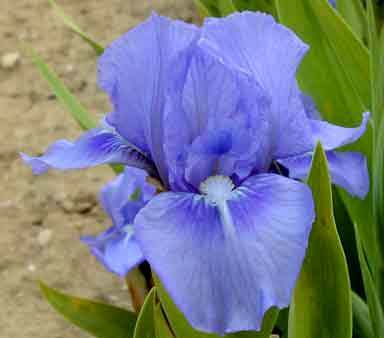 I really like the name 'Creole Can Can' and the beautiful blue color of the iris. 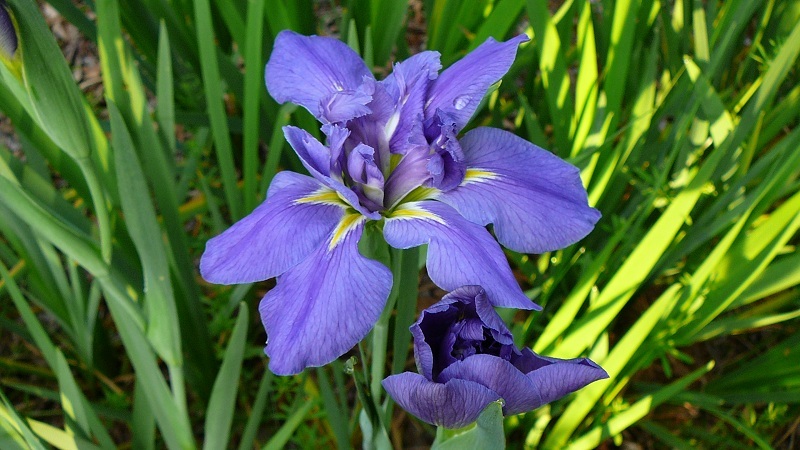 You will seldom find two blooms of this iris that are the same. Another beautiful cartwheel form by Marvin is 'Starlite Starbrite', a really nice white iris. 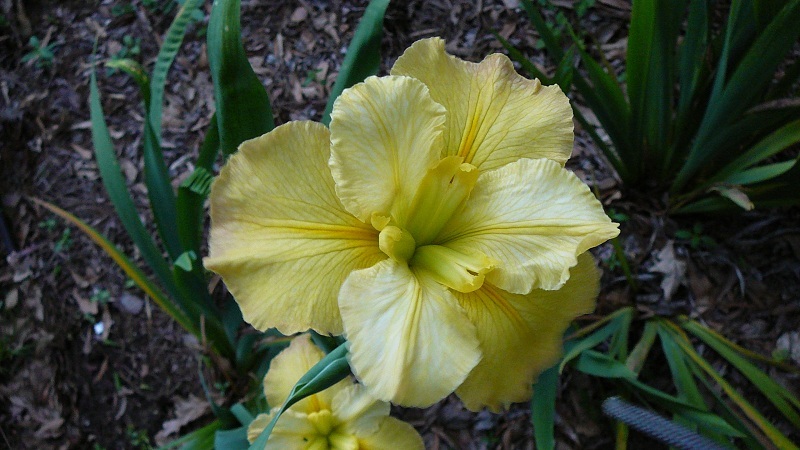 Joe Mertzweiller was a college professor and he hybridized over thirty registered LA irises. If someone held a gun to my head and said "pick a favorite iris or die!" I would have to pick 'Creole Rhapsody' because it has huge blooms and the coloring is just out of this world! Of course the name is just right for a LA iris. The iris 'Edna Claunch' has won many awards and is truly a lovely veined lime green iris, tending to fade to a lovely yellow.Edna Claunch (the real person) is a member of the board of the Society for Louisiana Irises and lives in Rochester, NY, where she was part of a group that planted a mass of LA irises in a friendship garden. It amazes me that these LA irises spend their winter under many feet of snow. 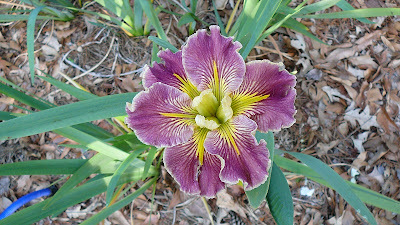 Harry Wolford, the hybridizer of this iris, is a retired educator and lives in Palm Bay, FL. Harry is past president of SLI. M. D. Faith is retired, and living in a small town near Little Rock, AR. 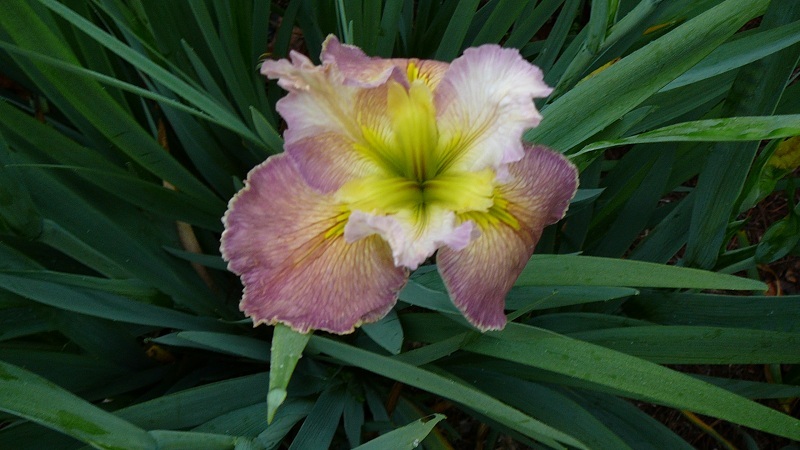 He has produced many beautiful LA irises and is a long time member of SLI. 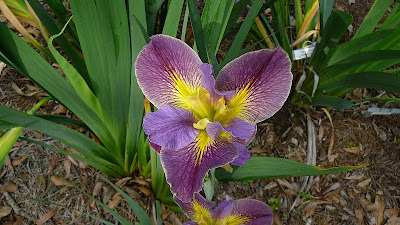 This iris has some unusual colors and is really an eye catcher in the garden. Heather Pryor and her husband Bernard have produced many beautiful LA irises from their commercial iris garden in Australia. I love the "sun ray" spray and signals on all the petals. The lime style arms really stand out. Penny Davis is another Australian hybridizer and although she has introduced only a few irises in the US, she has many of her hybridized irises growing in her native country. 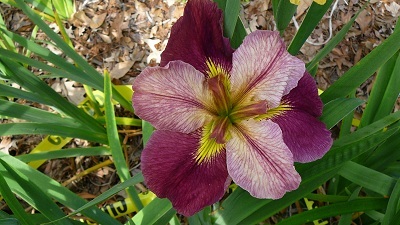 This is just a lovely colored (coloured) iris that is sort of wine red. 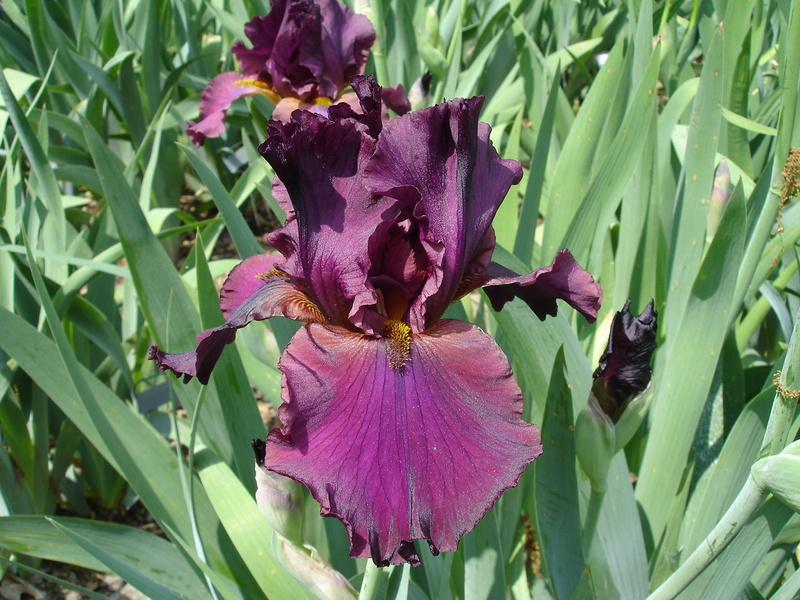 Charles Arny produced over 130 registered LA irises during his life-time. 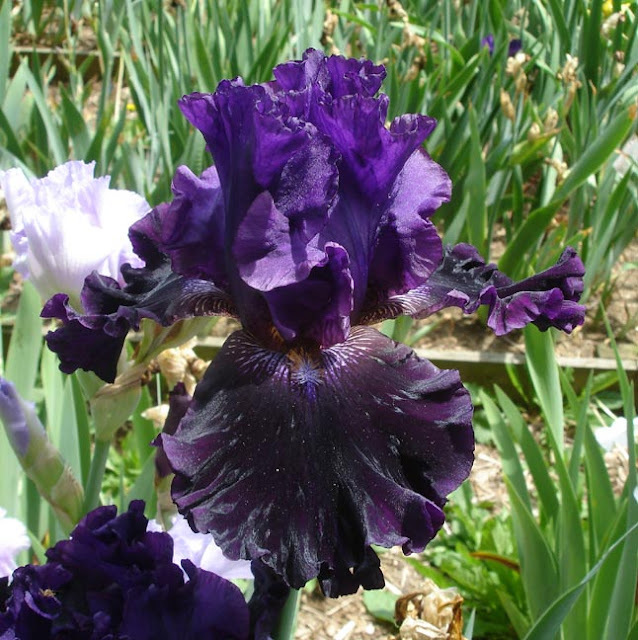 He won many awards for his irises and was a charter member of SLI. This iris has a beautiful white spray pattern on the falls. Another iris with this pattern is 'C'est Si Bon' (J. C. Tayor, 1983), which is a little darker color than 'Gertie Butler'. 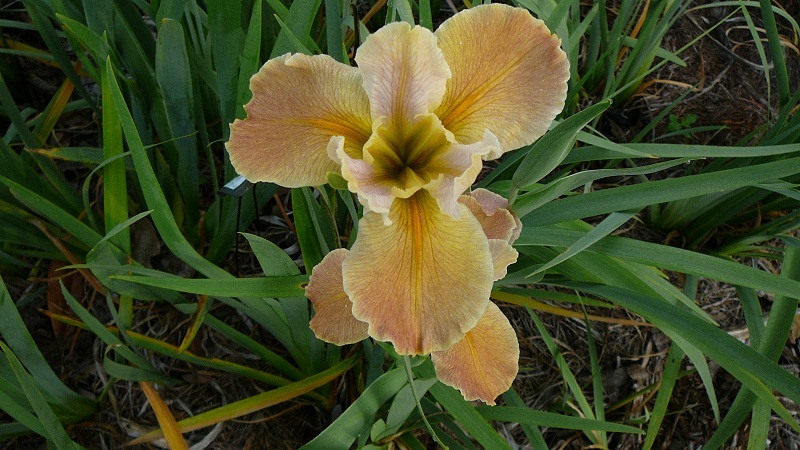 J. C. Taylor, another hybridizer from Australia, registered over 200 LA irises. 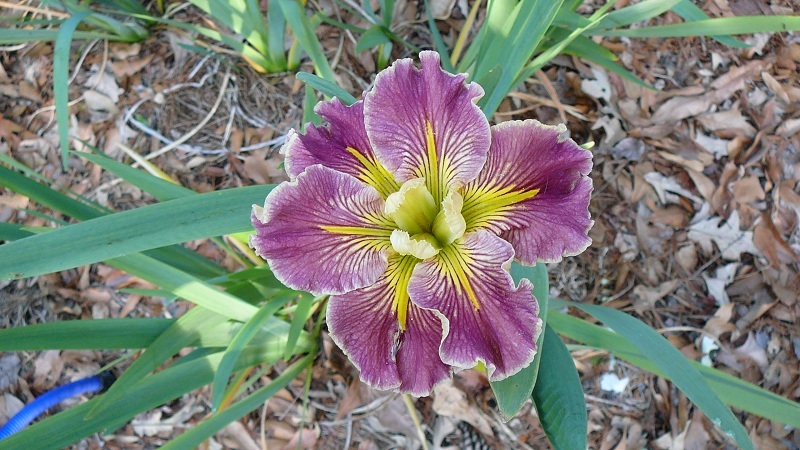 He named this beautiful pink iris for his fellow Australian hybridizer, Heather Pryor. This iris is definitely in my top 10! I have a large clump of 'Honey Star' and it puts on a show for me every spring. 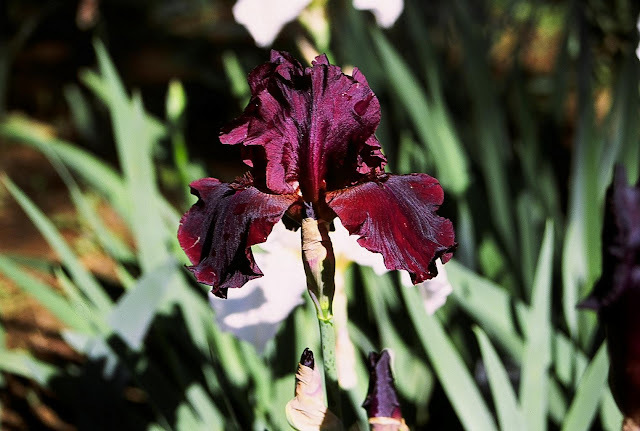 Janet Hutchinson also lives in Australia and has hybridized and registered over 30 LA irises. 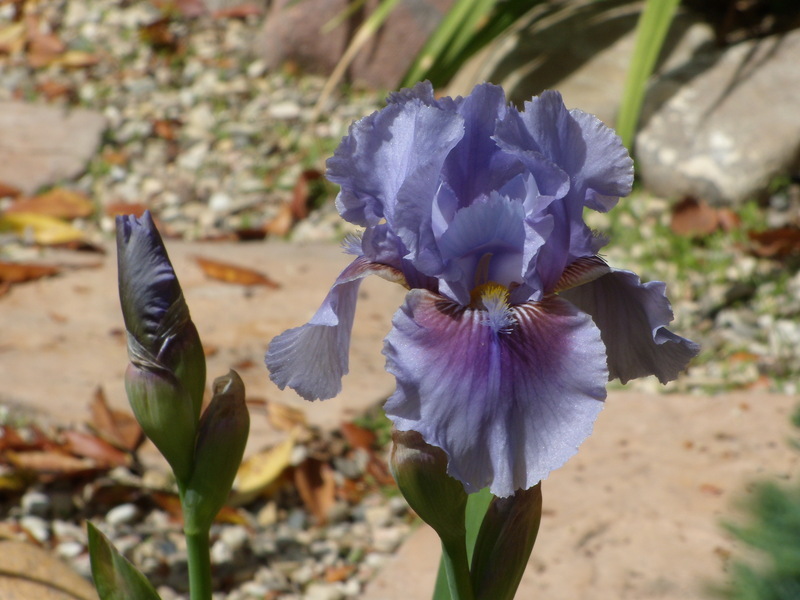 We have been growing and introducing irises registered by Richard Sloan and have enjoyed seeing his latest irises each spring. I love the name 'Hope and Glory' and the flower is really a beauty with the white standards. 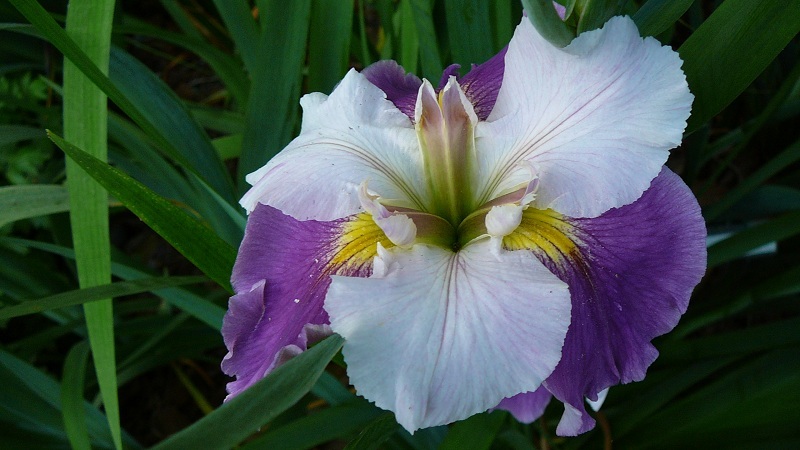 I am not really acquainted with Mr. Bruner but I love this tetraploid iris. The spray pattern around the signals is a feature I enjoy in irises. 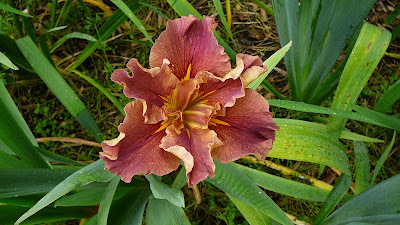 There are not many tetraploid LA irises and this one stands out in the garden. 'Mighty Rich' is a beautiful large iris with an eye catching signal. It may be an oldie but it is still a goodie! I am not familiar with C. Carrol but think she is also from Australia. I love this iris because of the unusual color which is registered as "cream ground with peach to dusty peach overtones." So, friends, I ask you, how can anyone decide that one of these irises is prettier than the others? See if you can pick yourself a "favorite" from the irises here and leave a comment about why you like this one so much. To learn more about irises of all sizes, shapes and descriptions, visit the web site of the American Iris Society or visit the Iris Encyclopedia to view many more pictures of irises. Since I live in Southern California, I always thought there was just one type of bearded iris- the tall one. That is because the other varieties, which do so well in colder parts of the country, fare poorly here in the heat. When I first discovered these little beauties, I went into zone denial and ordered some anyway. They are all now resettled into happy homes in cooler climes, and I visit them via photography and the Internet. The different types of bearded irises were originally hybridized from different species. The ones that are not tall bearded (TB) are collectively known as 'median irises'. 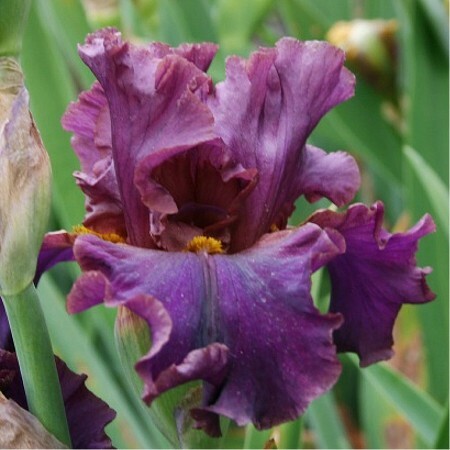 They are further broken down into Miniature Dwarf Bearded (MDB), Intermediate Bearded (IB), Miniature Tall Bearded (MTB) and Standard Dwarf Bearded (SDB) irises. Information about cultural requirements can be found here. These irises come in some really blue blues! 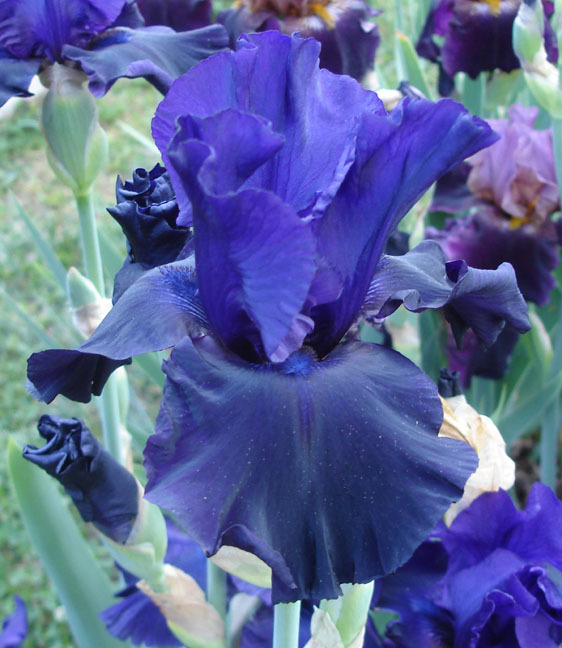 So here is the last of the photos on the bluest and best irises from across the Internet. Chad Harris of Mt. 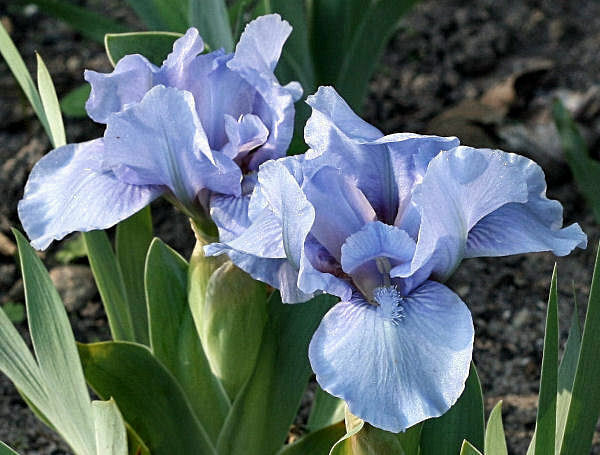 Pleasant Iris Farm, 'Ocean Pearl'. 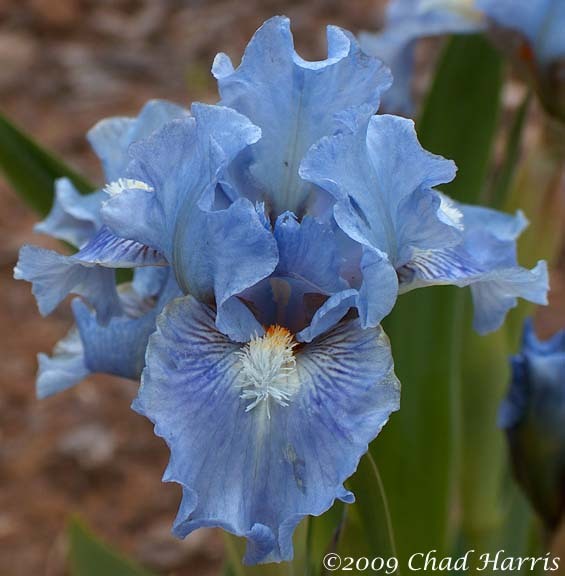 Lucy Burton, who hybridizes irises in Massachusets, chose 'Sapphire Gem' as her favorite SDB iris. This was the favorite of a number of gardeners. Chuck Chapman of Chapman Iris in Canada chose the SDB 'Eramosa Skies' as his favorite blue. This was another very popular choice. 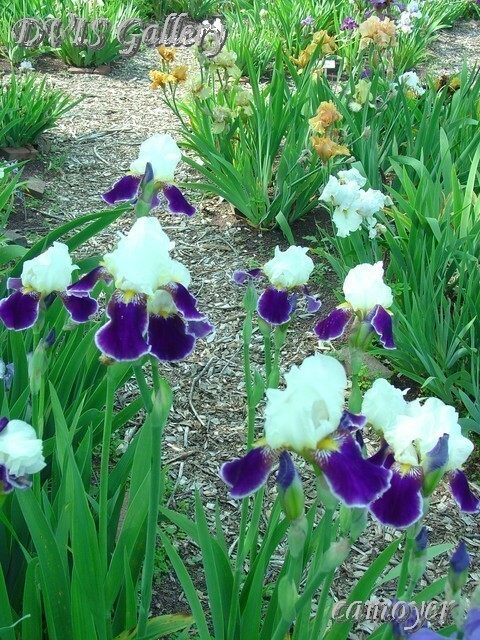 Miniature tall bearded irises grow from 16" to 27.5" tall, but bloom later in the season than the SDBs and the IBs. Sandra Eggertson chose the miniature tall bearded iris (MTB) 'Little Bay Denoc', which she grows in profuse clumps at her iris display garden Merlebleu in Manitoba, Canada. 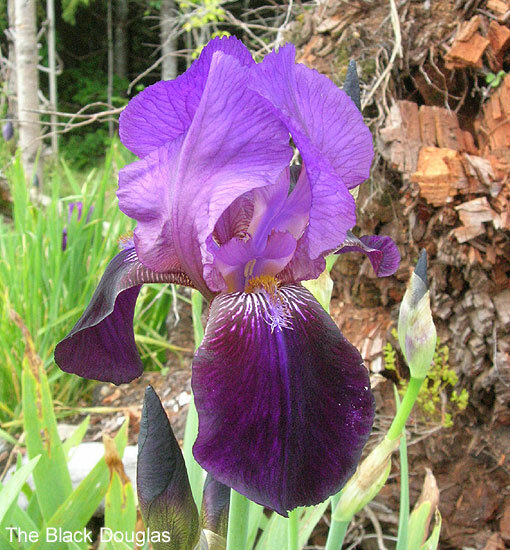 This iris got a number of votes. 'Sailor's Dream' likewise proved popular. 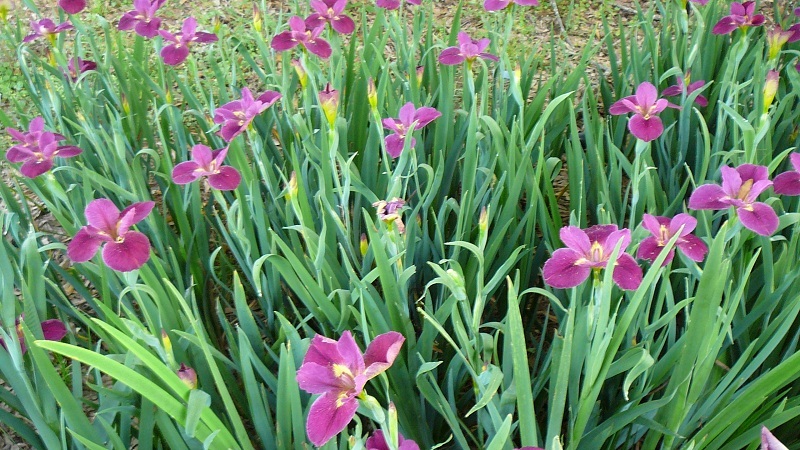 Intermediate bearded irises (IB) are characterized by 3.5 to 5 inch blooms, a bit smaller than the tall bearded irises. They top out at 27.5 inches in height, and they are called intermediate because they bloom after the SDBs and before the TBs. 'Alberta Clipper' is a nice light blue with ruffles galore. It won the admiration of a number of gardeners. 'Barrel House Blues' was the favorite of Lucy Burton. Do you grow median irises where you live? Which is your favorite blue? That is the end of our photographs of the best and the bluest irises. Stay tuned for the search for the reddest red iris next. Autumn is settling in here, darker days are ahead and soon it will be Halloween. 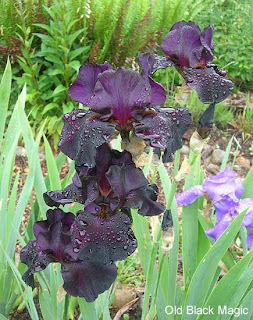 In honor of the season I thought I'd share a selection of the lovely black irises that grow in my garden. I'll start with a species that naturally exhibits a wonderful deep, dark color - I. chrysographes. 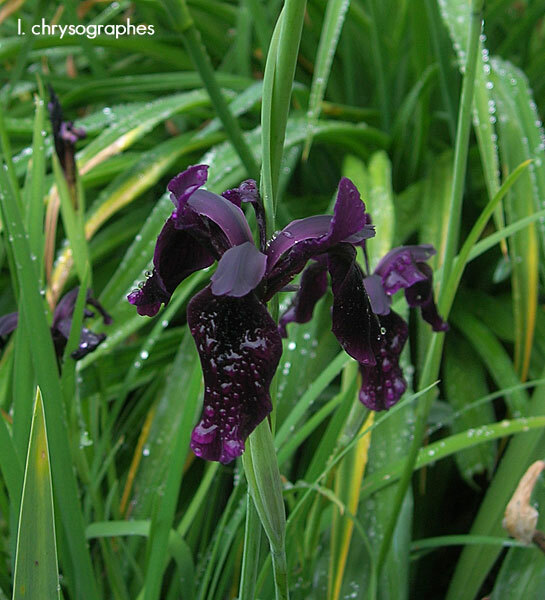 A sub-species in the siberian iris family, this little flower is native to China. The flowers are a very deep red-violet, with the falls being quite velvety giving it an even darker appearance. It is not the strongest grower, but the beautiful little blooms make it all worth it. I love their long pendulous falls. Black has long been a goal for hybridizers of bearded irises, and many of the best have worked to improve them over the decades. One of the first to receive wide acclaim was 'The Black Douglas', created by Jacob Sass and introduced in 1934. it was one of the darkest bitones of its day and also had excellent growth habits. It was extensively used in improving the color class. Paul Cook introduced an even more important variety in 1938 named 'Sable'. Here was a real approach to the deep black that was so desired. 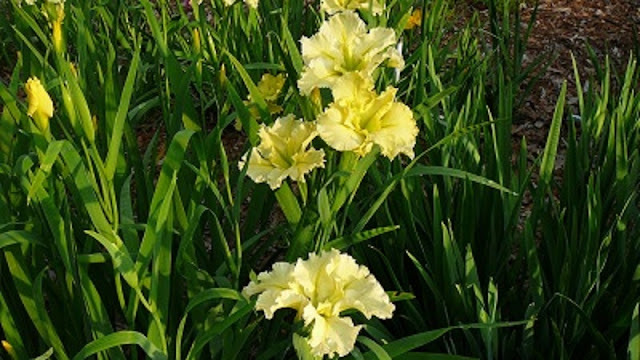 'Sable' also went on to win award and acclaim and was quickly used to create even more varieties. It is still much loved by collectors of historic irises. 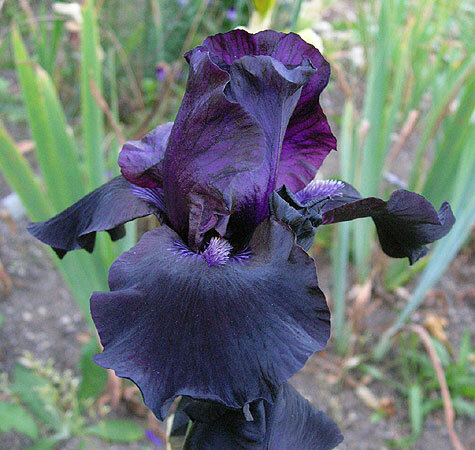 Paul followed up with another amazing dark iris in 1952 when he introduced 'Sable Night'. 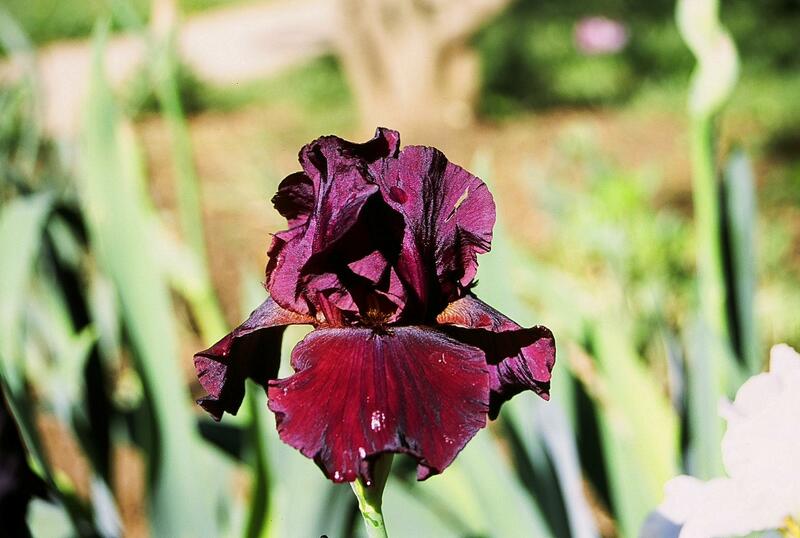 A delicious dark red-violet with very velvety falls and flawless form. it went on to win the Dykes Memorial Medal in 1955. The Schreiner's got into the act and in 1971 they introduced 'Patent Leather'. Here was a very different black iris! Instead of getting much of its dark tone from a velvety texture, it was a deeply pigmented self with a shiny, satin like finish. Its name is very well suited. The Schreiner's did another of my favorite black irises in 1996 with their 'Old Black Magic'. This variety never fails to cast a spell on visitors to my garden, and everyone wants a start of it. Thankfully it is an excellent grower and there often are extras to share. That same year, Sterling Innerst's 1989 introduction 'Before The Storm' won the Dykes Memorial Medal. It is still considered one of the blackest irises. Another of my favorites is a smaller variety, the Standard Dwarf Bearded 'Dark Vader', an R&L Miller intro from 1987. What a charmer it is! 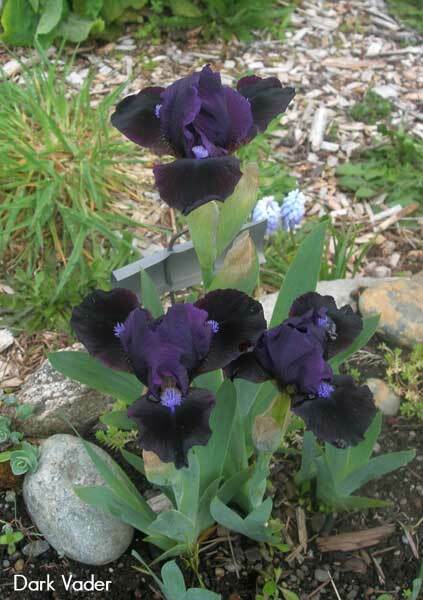 Dark velvety petals topped with light blue beards make a very rich color accent in early spring. These are but a tiny sampling of the wide variety of black irises that have been created over the years. There's bound to be varieties out there to please any taste. 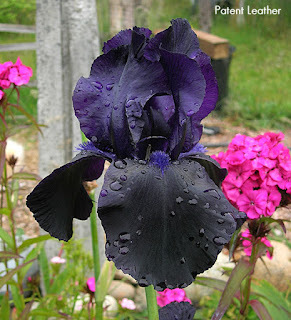 Black irises look great with just about any other iris color. Their dark tone can set a softer mood in the perennial border and supply an accent that makes brighter colors shine even more. If you have favorite varieties to recommend please share them in the comments.